This is a gun that I traded for from Tweak Ranger. Tweak did the custom paint job and the woodland tiger stripe came out quite nice. Tweak also put in a mixture of brand new CA and DBoys parts. The gun turned out very nice. It has good fps, around 330. The rate of fire is also quite nice. The paint job also adds to the value. Brand new, the gun retails for around $160. 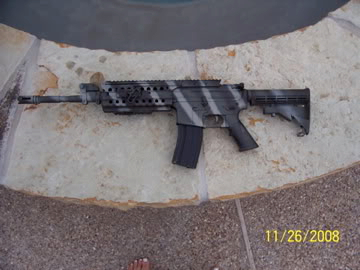 With the paint job and mag, I'd put the price around $10. I have only used the gun in small skirmishes and it is well maintained. The gun has good accuracy and $150 is a good value. Price: $150 for: Gun, mag, 8.4 battery, charger. Problems: The pistol grip has some tape on it, but it is only to give it better grip. Overview: This is an excellent gun. The paint job is professionally done and looks very good. The internals are almost new and the externals are great. This is an excellent M4 all around. 4. Western Arms 1911 A1. This pistol is fabulous. Western Arms is regarded as one of the best airsoft pistol makers on the market due to their attention to detail, quality trade marks and high grade internals. This is an extremely rare pistol. It is truly a collectors piece. The pistol shoots around 300 fps and has great accuracy for its short barrel length. 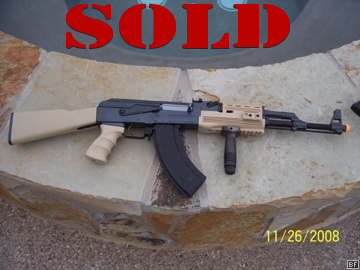 It retails for around $250 and comes with 2, 20 round magazines. I am willing to take $200. The only reason I'm reducing the price is due to slight problem of a broken piece inside the gun. Not sure what it's called, but it is causing some inconsistency while firing. 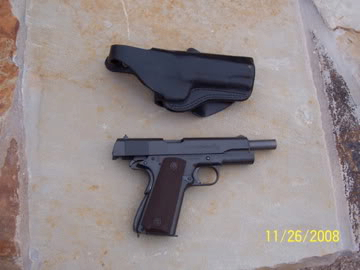 The pistol also comes with a holster used by my uncle who was in the FBI. Price: $200 for: gun, 2 mags, leather FBI grade holster. Problems: Small broken piece makes the shooting sperattic, no other problems. Overview: Excellent weapon. Perfect for a person going for a WWII loadout or looking for a good 1911. This will not disappoint. This gun is a beast! I really love it. I think you will to. I bought this gun a few years ago and used it a lot. The round count is pretty high, which has now led to it being broken. The gun doesn't shoot. I think it may have something to do with the piece that propels the bb through the chamber, but I'm just guessing. The gun is a beast though. 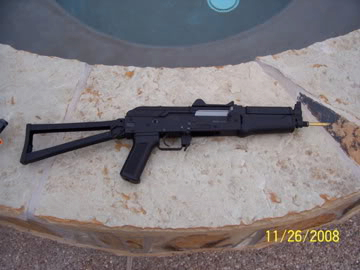 It is full metal and comes with 3 50 rd gas powered mags and a silencer. The silencer is really cool. The length of the stock is adjustable in 3 positions. The rate of fire is unbelievably fast and that is it's main selling point. 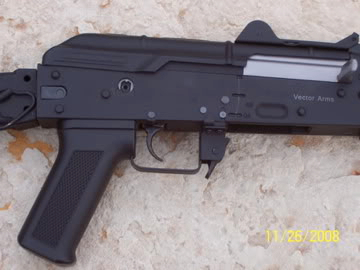 If you need a good CQB or backup weapon, this is it. New, the gun retails for around $150 and mags are about $35. The silencer is hard to find and is worth about $30 as well. I'm willing to sell this for $180. This is a very good deal just for the mags and silencer let alone the gun. 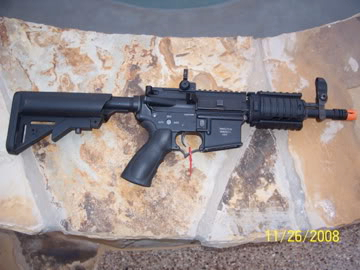 Price: $180 for: gun, 3 mags, silencer. Problem: The only problem is that the "firing pin" I think is broken. Overview: The gun is a very effective CQB gun and you won't be disapointed by the rate of fire. Prices are lowered. Make a reasonable offer. Bump: I am now selling the DBoys, the Mac 11 with no mags, and the WA 1911 w/ 2 mags, all for $200. The only trade I'm looking for is a TM/CA MP5K. If you have one that is relatively new, I will trade. No mag is required, but a battery would be nice. I will be at Deadfest 2, if your interested. 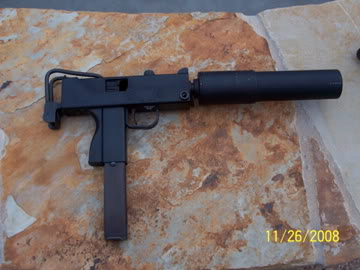 Can i ask why you are you selling tha mac 11 with no mag? Job/hobbies : Airsoft, The Forum?